Fallout 76 is out in the wild now, and now everyone’s getting their chance to explore the irradiated country roads of post-apocalyptic West Virginia. That includes critics, who are collecting their thoughts on Fallout’s new adventure into the always-online multiplayer survival genre. Now that it’s an online multiplayer experience, Fallout 76 plays host to mainstays of online games that are brand new to the Fallout universe – things like public events, PvP, and fire teams are now part of Fallout. But familiar elements like branching dialogue options and NPCs are notably absent. Has the transition been a smooth one, or are we walking into a nest of sentient Deathclaws? 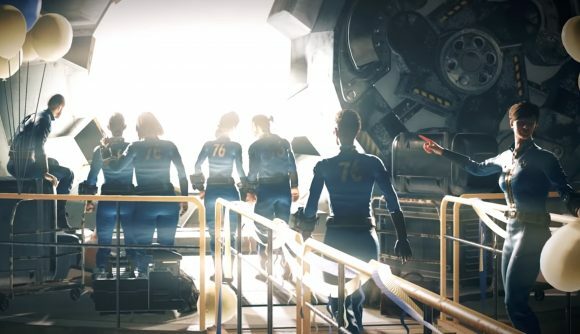 It’s hard to deny the fact that Fallout 76 has some interesting ideas: there’s the new card-based perk system, for instance, and the ability to team up with friends and interact with real people is a theoretically compelling one. But concerns about how those work in practice have been on the forefront of the gaming public’s mind since Fallout 76 was announced, and so far it seems most of those were well-founded. Not exactly ringing endorsements of Fallout 76 – reviewers have uniformly noted the persistence of bugs, but they’re also generally disappointed with the lackluster quests and empty-feeling world. But many have said that it still feels like a modern Fallout game – for better and for worse. In our review (click the link in the above list), Julian says Fallout 76’s few bright spots quickly wear thin in the face of boring quests, lacklustre combat, and a terrible menu system – all of which turn it into a “stagnant and intensely frustrating” experience. Matt played about an hour of the beginning of Fallout 76 during the Xbox 1 beta, which you can check out above if you’re still curious about what a multiplayer, NPC-free version of Fallout actually looks like in action. And if you’ve already decided to hop in, we’ve got a bunch of guides right here to help make your stay in West Virginia a more pleasant one.